"These s'mores are neater and easier to make than traditional s'mores. We love making them while camping or sitting around the fire pit. The quantity can easily be adjusted to suit your needs." 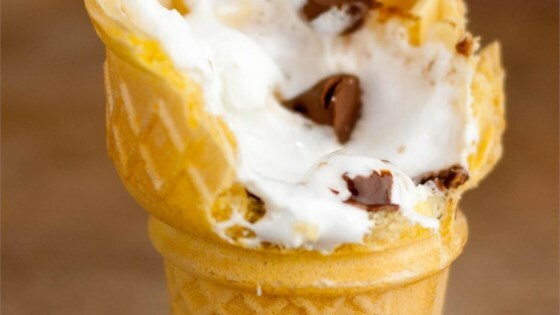 Place about 1 teaspoon chocolate chips into an ice cream cone, followed by a layer of mini marshmallows. Continue layering chips and marshmallows into the cone until full. Repeat with remaining chips, marshmallows, and cones. Wrap each cone tightly in aluminum foil. I made mine in a microwave and it was a hit. Just constantly watch it -- as soon as the marshmallows puff up, take the cones out. We got the flat bottomed cake cones and the taste as part of the overall dessert was only ok. Not too much fits into the cone but it was fun for the kids and easy to eat. Loved these! Little kids can make their own and clean up was SO easy! well we put it in the microwave for one minute and it was not good. don't suggest doing it like that.